HAPPY INTERNATIONAL WOMEN'S DAY! Hope you are celebrating. I'm excited to share the news that I'm helping the International Women's Forum launch its new IWF Game Changers podcast. It will be a monthly conversation about "life in leadership," with trailblazing membes of the IWF, an exceptional network of over 7,000 women leaders from six continents. 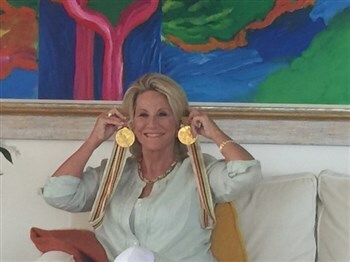 The inaugural interview is with Olympic Gold Medalist and sports broadcaster Donna de Varona, who co-founded the Women's Sports Foundation with Billie Jean King. IWF Game Changers is available on all major platforms, including iTunes, as well as through the IWF website and my POWERING UP podcast. 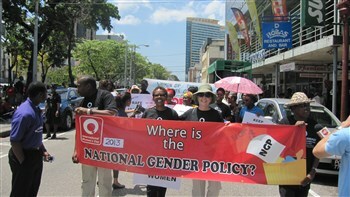 One of my favorite International Women's Day experiences happened six years ago in Port of Spain, Trinidad where I was at the head of a Women's March, carrying a banner that read, "Where is the National Gender Policy?" The U.S. State Department sent me there to be part of the International Women's Day celebrations. I will never forget the exchange I had with March Founder and Activist Hazel Brown, as we watched the friendly faces waving at us and all the news media coverage. "Wow Hazel, this is great! The people are really supportive," I said to her. Hazel looked at me and said, "Yes. But 15 years ago when we started this march, they were throwing trash and even bottles at us!" The memory is all the reminder I need that women all over the world are making progress. But we still have a very long way to go! Let's keep marching, raising our voices, running for office and visibly supporting women who step forward into leadership roles. Women everywhere, including here in the U.S., still face rampant sexism, whether it's misogyny and sexual assault or pay inequity and unconscious gender bias. One of my goals is to get the Equal Rights Amendment (ERA), which was first introduced by the Suffragists nearly 100 years ago, passed in my lifetime!